The Omega G is one of the most advanced Robotic Vacuums on the market today. It gets around the house moving easily from carpet to tile to hard wood floors. Its main feature is its a five-step cleaning system with enhanced Cleaning Coverage and Visual Camera Mapping System. It has an ultra powerful motor with improved suction power that collects more particles than most models. It has 2 elaborate side brushes, 19 Smart Obstacle Detection Sensors and adjustable climbing height of 19/32 inches. It has various cleaning modes of Auto, Max and Spot, a slim design of 3.5 inches to easily get under sofa's and beds. The Omega G comes with a Wet Mopping function with an Infrared Remote to control your robotic vacuum. I was looking for a good robot vacuum cleaner mainly to pick up cat hair from my hardwood floors. I chose this particular vacuum because of three main reasons: 1. it has 2 side brushes (unlike most robot vacuums that have just 1), which allows it to pick up more efficiently 2. it has that camera mode, which really helps it not bump into obstacles - although it still bumps into chair legs, it does not bump into larger items like my other robot vacuum cleaner did. I also have long curtains which puddle onto the floor. my previous robot vacuum cleaner always got stuck on them. this one gets really close to the 'puddling', but does not touch it. 3. the wet mop option - I really love this as it attaches to the back of the robot - and "mops" the floor as it vacuums. I like to keep my hardwood floors not only free of cat hair, dirt, but also of dust - and wet mopping completes the cleaning process for me. The only negative to this vacuum is that it is a little loud, especially when in "turbo" mode...but it is something that I can definitely look past taking into account all of the positives of the iCLEBO Omega. I absolutely love this robot vacuum. It is incredibly easy to use. I was surprised to see it's suction power. My carpet looked professional cleaned after just one use. I would recommend this vacuum to anyone who's looking for a high powered machine with no sweating involved! I have now used this for about 2 weeks, in lots of different rooms. It does a very good job, and picks up a surprising amount of dirt and cat hair. It is especially good that it is low, and can get under most furniture. It does not seem to miss spots, unless obstacles are in the way. I like it that you can put it in a room, close the door, and come back later to a clean room. I love this Robot Vacuum. It makes my life so much easier and my house looks clean all the time. ICLEBO.......Did my research....all the research pointed to this was the best......They were right! simply amazing easy set up, easy to use! will definitely recommend this product! If you want your life made easier.....here is a big start! Have to see to believe how great this cleaner is. I bought this to help my wife out. So I set it up and let it lose. It was fun to watch and did a great job getting under the furniture, beds, and little corners. He does not miss much and returns home when he is tired. My wife was sceptical but now it has become her friend - named him George - ha. iCLEBO is a very good product. Before buying it I did research, and it was my number one. What can I say after having used it more then a month. I still love it. the quality of cleaning is excellent. There is only one concern. It does not always remember the obstacles and reports the errors on the same places as it did before. This prevents me from programming it for the specific time in my absence. Nevertheless, I don't regret buying ICLEBO as I am more then satisfied with quality of the work it is doing. Both of my daughters told me I need a Roomba to use at my house. I have never been impressed with the job the Roomba did at their houses so didn't feel the expense was worth it for me. I did borrow one of my daughters' and tried it at my house a few times. After several conversations about how it is better for me than pushing a regular vacuum; even if I didn't like it as well, it would be good enough. I decided if I was going to try it I was going to try something different. Yay for Christmas deals! A fantastic sale gave me the opportunity to do that. After looking at the deals and doing some research I decided on the iClebo Omega. 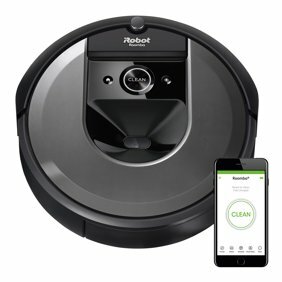 I used it without reading the manual and though I thought it worked as well as the Roomba I wasn't overly excited about it. I had to go away for a few days so decided to take the manual and learn more about properly using the iClebo. Wow, what a difference it makes when you know the rules of the road. Those manuals can make a difference. After another trial, I was impressed enough that when I found a one day super sale to get another iClebo Omega for a savings of an extra $130 off I jumped on it. I figured, even though I wasn't completely sold on it yet, I could keep using the first one until I made up my mind and if I decided against it I could return both of them. My house is over 3000 sqft so I do need two of them for my own perceived efficient scheduling. Perfect? NO but I do like the performance better than what I experienced with my daughter's robot, used in the same areas. It does climb but when it climbs on the cushion fatigue mats in the kitchen it pretty much misses around the edge of the mats on the tile. It is better to remove the mats. It does better on area type rugs. It must have got stuck under something because it got some bad gouges on the top of it. It must have found a way out because it returned to its charger when it was done. The overall cleaning is very good. It picked up more crumbs and dog hair than the other brand borrowed from my daughter. I would definitely recommend to family and friends as long as they are not expecting perfection. What a time saver. Our Boxer leaves short hair all over our floors, and this robot will be frequently used. Couldn't keep up without it. There is a learning curve to operation because of the many functions, but once you get it cleaning it works great.